This cake is made from two 8” cakes ( too much chocolate cake recipe found on all recipe .com, ohh so good); the top layer was a 4” white almond sour cream cake. Unfortunately I tried a new buttercream recipe and as you can see it did not crust well at all. The dolls were made from using my edible printer onto sugar sheets and then carefully cut. They were then paced on fondant, cut carefully again, to show well on the pink buttercream frosting. 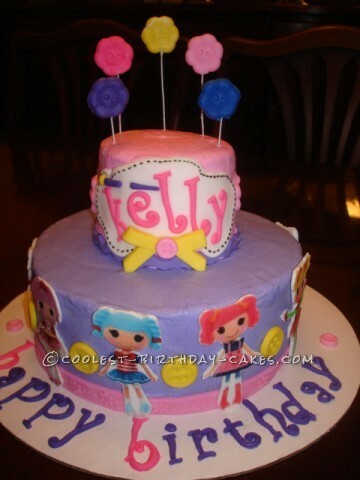 The buttons were made with fondant using Wiltons button and bows mold, as was all the trim. I free handed the name plate and used an edible writing pen to make the stitches. When the 4 year old birthday girl saw she declared “It’s the best cake EVER”. I was embarrassed about the frosting but it was a lesson learned and the cake was for my great niece and a freebie at that. Evidently 4 year old girls do not notice the imperfections of the icing!